MarkLogic Data Hub Service is a fully automated cloud service to integrate data from silos. 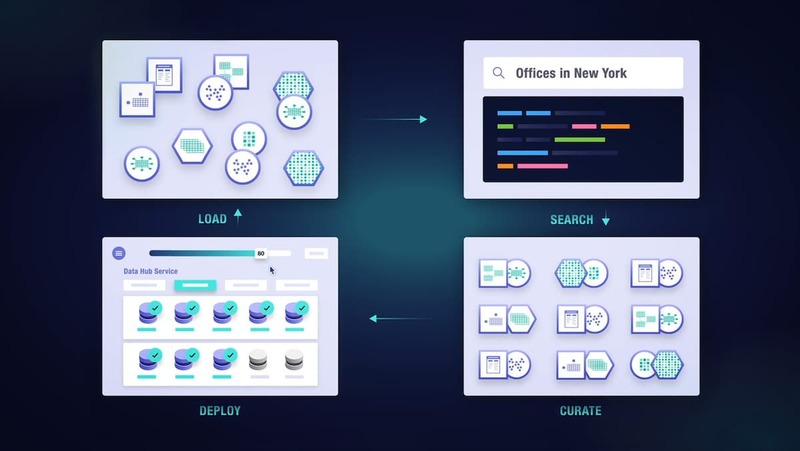 Based on the MarkLogic Data Hub, the service enables agile teams to immediately start integrating and curating data for both operational and analytical use. Delivered as a cloud service, it provides on-demand capacity, auto-scaling, automated database operations, and proven enterprise data security. Unlike other cloud services, however, it’s cost-effective and predictable even as enterprise workloads fluctuate. Go beyond a mere Database as a Service (DBaaS). You derive all of the same operational benefits, but aren’t just getting a raw database – you are getting a powerful, fully configured MarkLogic Data Hub that lets you do more and do it more quickly. The MarkLogic Data Hub excels at multi-model data integration. It enables you to load data as is, curate that data to form a unified, actionable 360 view – and provide easy ways to access that 360 view. You don’t have to spend time stitching together multiple services in an attempt to assemble all the functionality you need. Graphs, documents, geospatial, relational data, harmonization, mastering, and much more – it’s all built-in and ready to provide value. Learn more about the Data Hub architecture with our Introducing the Operational Data Hub eBook or dive into the Framework itself. We make data integration and curation easy. Define your data service, integrate data as needed, and make changes later. Libraries and APIs are included as a framework, so all you need to do is define the business need. The Data Hub is built on MarkLogic’s multi-model database. Rather than stitching together countless components, you have the simplicity of one unified platform with built-in search and ACID transactions. Rely on MarkLogic for data governance and security. With advanced features, you can track data lineage and provenance, encrypt data, anonymize data, and redact data so it’s easily shareable. Two core concepts of a MarkLogic Data Hub are the ingest data flows and curation data flows. When using MarkLogic Data Hub Service, the repositories, tasks, and plugins are readily available to start creating these data flows. No data gets discarded. But, it does get harmonized so it’s consistently queryable. MarkLogic does this by leveraging the flexibility of the document model, which allows for an iterative approach. MarkLogic’s built-in RDF triple store allows you to enhance your document data with semantic metadata. You can also do Ontology Driven Entity Extraction to make your data more meaningful and discoverable. Leverage fuzzy logic and AI to match and merge data so you can master data quickly and automatically without having to buy a separate MDM tool. Data is encrypted at rest and traces lineage through the integration lifecycle, protecting data access at a more granular level than any other multi-model database in the industry. We support all the industry standard APIs like ODBC, REST, and Java. We also support connectors for Hadoop, Tableau, and many others. This gives you the most flexibility and ease to use your harmonized and curated data. MarkLogic Data Hub Service allows you to focus on your business and leave database infrastructure and operations to the experts at MarkLogic. This means agile teams can immediately start integrating data and building apps while also reducing infrastructure and personnel risk. Already a customer? Log in to Cloud Services. There’s no lag time to get infrastructure up and running. The service does it automatically. With a high level of abstraction between application development and infrastructure, developers get going faster and operations run smoother. Pay only for what you need. As a subscription service, you can start small, and auto-scale based on demand. Even better, spikes in demand don’t cause spikes in cost. MarkLogic’s elastic cloud credit pricing keeps costs consistent and predictable. With security, governance, and transactional consistency, MarkLogic Data Hub Service is for mission-critical systems. It is designed and managed by the same engineering team that built the underlying, enterprise-grade MarkLogic database. Automated Scalability — MarkLogic Data Hub Service is unmatched in the ability to auto-scale. You define limits and thresholds. MarkLogic scales to meet demand — quickly, transparently, and automatically provisioning nodes as needed. Our unique architecture ensures you don’t have to worry about migrating data, re-partitioning, re-balancing, or re-performing other operations required by other databases when scaling up. Automated Upgrades — MarkLogic Data Hub Service automates both installation and upgrades. This means no waiting or planning for downtime, whether for a small patch or a more significant release. Automated Backups — Backups are critical, but a chore. Automating backups removes the hassle and ensures the safety of your data at all times. Guaranteed Availability — Rest easy knowing your data is always available. MarkLogic Data Hub Service is designed to meet high performance SLAs and provides 99.95% availability. Secure By Default — Effortlessly protect your sensitive data. MarkLogic Data Hub Service automates security setup and provides end-to-end encryption for optimal data security and shareability. Leading organizations around the world rely on MarkLogic Data Hubs. Now with our cloud service, it’s even faster and easier to launch a MarkLogic Data Hub. When it comes to mission-critical operations with security, governance, and transactional consistency, MarkLogic’s track record is proven worldwide. That reputation was built by the same passionate experts who built our core database and who designed the MarkLogic Data Hub Service; and it’s those same experts who also manage the service. Read about the underlying MarkLogic database and what makes it unique. Ready to get started? The MarkLogic Data Hub Framework is free to download. Become an expert on ingesting and curating data with a MarkLogic Data Hub. To get started using the service or see full pricing details, visit the AWS Marketplace.